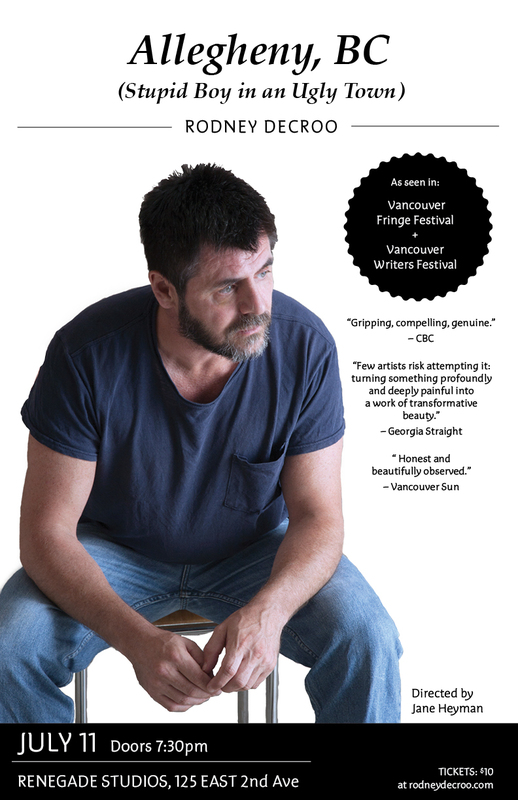 After a great run of shows at the Vancouver Fringe Fest and Vancouver International Writers Fest last year, Rodney DeCroo’s “Allegheny, BC (Stupid Boy in an Ugly Town)” returns to the Vancouver stage for a performance at Renegade Studios on July 11. Vancouver singer/songwriter Rodney DeCroo delivers raw footage of a childhood marred by violence, sudden uprootings, and abuse. Allegheny, BC is a candid, gritty tour through DeCroo’s troubled past in a small coal town outside of Pittsburgh, PA, the bush of northern BC, and his young adult years in Vancouver. Scenes of boys growing up along the banks of the filthy Allegheny River cut to hunting trips with an unpredictable father haunted by the Vietnam War to snapshots of seedy bars and strip clubs as the narrator struggles to come of age despite his circumstances.